Pete Burrows, director of M&B Healthcare Group – which operates 11 pharmacies across north-west England – told C+D the car crashed into Hawkley Pharmacy on Carr Lane at 11am on March 2, after an “elderly gentleman lost control of his car while parking up outside”. “Thankfully, nobody was injured and the gentleman was taken home after being checked over by paramedics,” Mr Burrows said. “It’s business as usual,” she added. 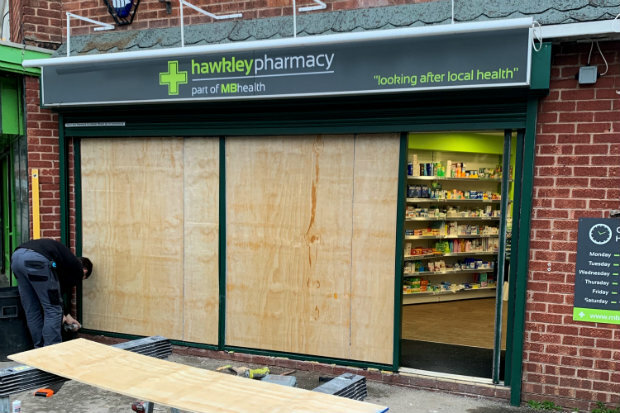 Local builders boarded up the front window (pictured below) of the pharmacy on Saturday afternoon, and glass and debris from the incident was removed in time for the branch to open on time at 9am today (March 4).